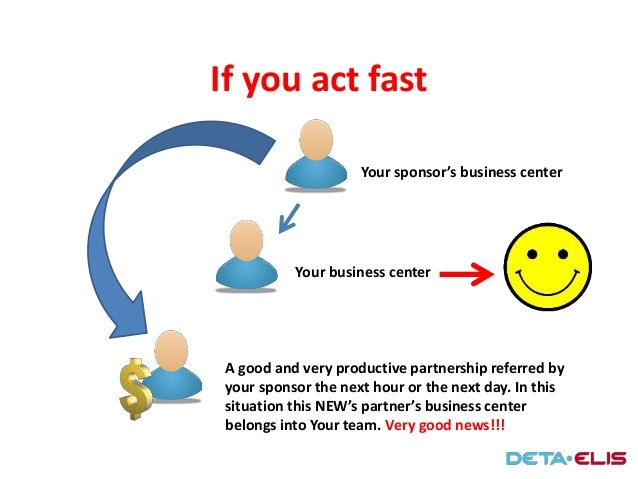 If you wish to help other people while building a residual income in the background, then joining the Deta Elis Network of people is the way forward. Many economists are predicting that the Networking business is going to be one of the fastest growing of all businesses. Basically, once you pay the €40 Euros for registering yourself in the Deta Elis Network Marketing team, plus purchasing one device with a minimum value of €250 Euros, you will be ready to begin earning commissions for every device you recommend to others. If you make a recommendation and the customer orders, stating your name as sponsor in the SPONSOR box on checkout, then the DEHOLDINGS company will automatically place in your back office account a sum of money as a direct COMMISSION for the sale, as well as collating BONUS POINTS which soon add up and are converted into money every 24 hours and placed in your back office. Once you are registered, you recommend to a friend to purchase the DEVITA AP 30, for example. This sale will earn you €87.50 Euros which will be in your back office account within 24 hours, PLUS you will collect 200 BONUS POINTS too. When you collect 1,000 BONUS POINTS, this converts to another €75 which get placed in your back office account again. What is the best way to set up my Network account as this sounds interesting? This is an excellent question! Basically, the best way forward is to set up a TRIAD – this is yourself and two other people underneath you – can be family members, spouses, children over 18 years old or anyone that you really trust. You will be on top of the TRIAD and the other two family members below. When you recommend a device to someone and they buy, then the purchase is placed on one of your two members below you. This way you will automatically get the commission and bonus points as it is always the person above (the SPONSOR) who receives the cash. Interesting, but how do I make a passive income from this model? Another good question! Simply remember that you are getting bonus points from EVERYONE who is recommending the devices to others – even if you do not know them or never met them! Let’s give another example – let’s say you recommend a device to your friend JOHN who then recommends a device to his neighbour SUSAN. You have never met SUSAN, but given that JOHN is in your DOWNLINE (underneath you as SPONSOR) then everyone who JOHN sells to, you automatically benefit. This can be repeated in your DOWNLINE hundreds of times, so that in the end you do not need to sell any devices as you are being rewarded by the sales that others are making. What is my role as SPONSOR? Your role as SPONSOR is to encourage others to build the same TRIAD that you have built, but underneath you as part of your team. This soon becomes VIRAL, as if all these teams underneath you are selling devices, you are being rewarded for each and every sale – you can see the potential here! Do I need to keep stock of the devices? Absolutely not! The beauty is that once an order is placed, the company will send this out to the customer, and automatically reward the SPONSOR. How can I find out more about this interesting business? This will give you a much more detailed plan of what to expect and how to build your business.